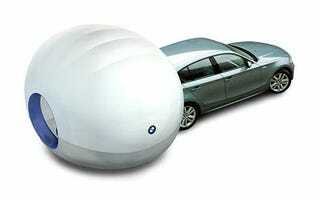 Here's a camping bubble that's reminding us of the bubble boy, but this one is made specifically for BMWs, hooking on to the back of a Beemer and keeping its tony occupants away from those nasty elements. The BMW Air Camper inflatable tent is said to be big enough for two adventurous campers. Check out that BMW logo on the side, completing the illusion of swank adventurism. Camping? Maybe this is targeted toward BMW owners who can't keep up with their car payments. Next up: a cardboard box for Rolls-Royce owners who want to rough it, complete with designer newspaper blankets.